Emmeline Illustration: Happy 80th Birthday to The Beano Comic! Happy 80th Birthday to The Beano Comic! 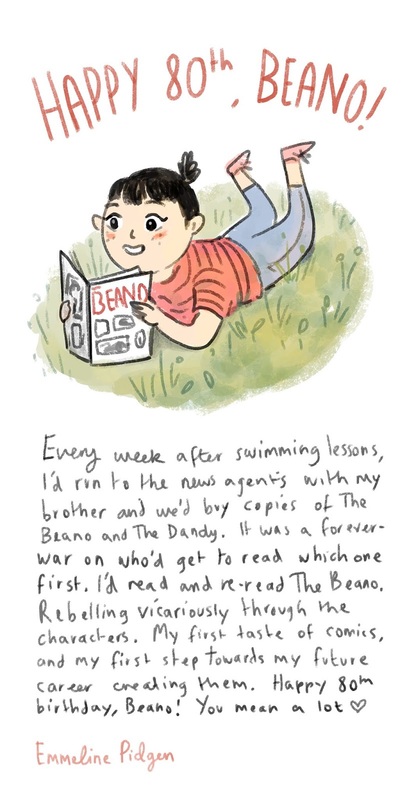 A little love letter to The Beano comic on their 80th birthday! I think the image says it all, really, but it's been great for me to follow the threads of inspiration throughout my life from my childhood favourites, to the work I'm creating today. Here's hoping that the children's comics I'm creating, like Nona The Ninth for Goof comic, help inspire some other excitable little girl whose damp hair smells of chlorine, but is absolutely beaming after spending her pocket money on comics.